It first started with an idea in the fall of 2006. I had recently moved to Aprovecho, outside of Cottage Grove, OR, after a brief stint in Portland. My partner Abel Kloster, our new friend and Aprovecho staff member Josh Fattal, and I hiked to the top of our watershed. We hiked through remnant oak savannahs where madrone and incense cedar still stand amid the rapidly growing douglas fir. We hiked through hundreds of acres of clear cut and replanted douglas fir plantations. Living in the foothills of the Coast Range in Oregon is like living in a monoculture, the forest replaced by the trees. Still, it has its beauty, and the understory plants, the salal, Oregon grape, the trailing blackberry, come back after a time to provide food and habitat for some of the former residents. We reached the top of the watershed, where looking north and west; one can see the drainage of the Siuslaw River as it carves its way through the rugged Coast Range to the Pacific Ocean. Looking south and east, the beginnings of Willamette River of which our little creek is part. Looking west, we struck up a conversation about a seasonal migration to the coast, where we could harvest seaweed and salt. We could walk there in a week, we reasoned, and with a group be able to carry enough salty, mineral laden foods back to the valley to nourish us for the rest of the year. This led into a conversation about the salt march led by Gandhi in 1930. In British-ruled India, salt was a taxable commodity, and even the poorest people had to purchase it from the government-owned salt works rather than harvest it themselves from the coast. Gandhi led his first satyagraha march in protest over the Salt Tax, walking with people for 240 miles to the coast, where he picked up a lump of salt and catalyzed a non-violent revolution. With this conversation, our ideas about sourcing the necessities of our diet more locally were solidified. I started doing more research about salt. As a necessary component of our daily diets, salt has always been a valuable commodity, traded from the coasts inland or harvested from inland seas in landlocked areas. Prior to the advent of refrigeration and canning, salt was the primary method of preserving many foods. Salted fish and meats were vital commodities for trade in many cultures for thousands of years. In modern times, salt curing has fallen to the wayside as more energy-intensive forms of food preservation have been favored. However, salt still features regularly on every grocery list. I, like many of my friends, spent plenty of money on Celtic gray sea salt. While this salt is tasty, I started to wonder about the merits of shipping salt from France when the cold salty waves of the Pacific Ocean broke less than 100 miles from where I lived. These ideas simmered for another year, while life went on in our community. Students came and went, many meals were shared. At this time, I was responsible for ordering the bulk foods for the community. What this meant was that I took inventory, made an order, then met the big truck at the bottom of the road where various 25 or 50 pound bags of grains and beans were traded for money. After these encounters we both drove off our separate ways- the truck driver to an organic wholesale distribution warehouse in Eugene, myself back to our campus, where students were immersed in learning many aspects of sustainable living- organic gardening, appropriate technology, sustainable forestry. I began to wonder about all of this food arriving on our doorstep. Was this sustainable? Let’s see, mung beans from China, quinoa from Bolivia, olive oil from Argentina, salt from Cargill?…I started to realize that as an educational center, we had the ability to truly radicalize the expectations of our students when it came to both menu and course offerings. We could also use the consistent income generated from our programs to support local farmers, not only for produce, but for dietary staples. As this idea was discussed amongst the staff, we decided that it would be interesting to embark on this experiment in the context of a different kind of educational program. This program, which we called “Local Food Networks and the 100-Mile Diet,” required several months of planning. We networked with many local groups and individuals who were and are pushing forward local foods initiatives. These included the Willamette Farm and Food Coalition, Eugene Local Foods, Slow Food Eugene, Harry McCormack and the Ten Rivers Foodweb, Food for Lane County, and more. We made contacts and purchase/trade agreements with local farms in order to ensure we could source enough food for 25 people for the duration of the program. The Aprovecho garden was planted to capacity in order to meet the swelling demand of our local foods challenge. The first two weeks of the program, we stayed on our “normal” diet. Many of the course participants were vegetarian or vegan, and started to slowly incorporate animal products during this time as they would feature prominently once we began the four week ‘One-Hundred Mile Diet.’ People also had time to wean themselves off of caffeine, sugar, and tobacco. As the day of the local foods challenge approached, we had all of our local food staples on hand: milk, butter, eggs, chicken, beef, lard, pork, acorns, filberts, potatoes, winter squash, corn, pinto and black beans, some wheat, and more vegetables than we could possibly eat. The one thing we were missing was our salt. That pilgrimage that we had imagined years before from the top of the watershed came to pass one beautiful September day. We chose a beach that was far enough from an inhabited drainage that we felt comfortable with the cleanliness of the seawater. We woke 2 hours before sunrise when the tide was at its lowest. The groggy group hiked down to the rocky intertidal zone and harvested seaweed in the gray dawn light. Then we set to work on setting up the salt works. 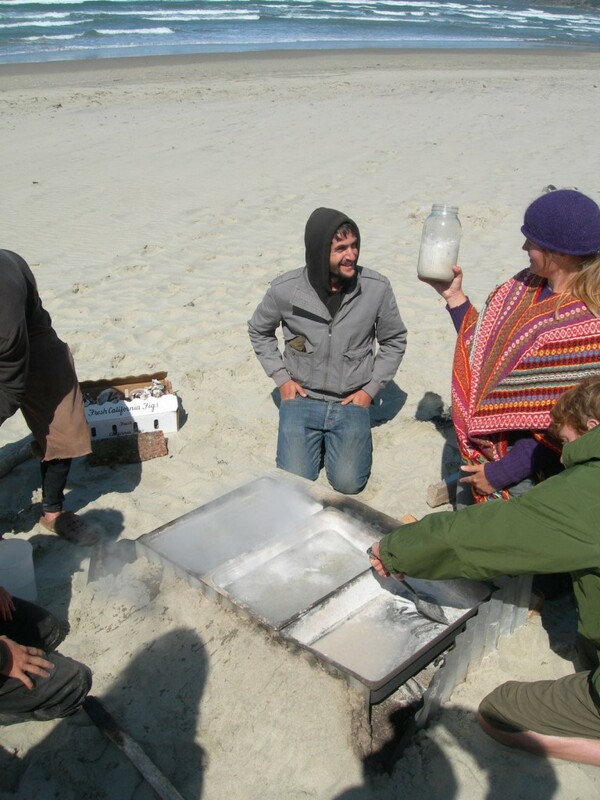 After consulting with our resident appropriate technology instructor and stove designer, Mike Hatfield, we came up with a simple wood-fired salt evaporator that could be set up on the beach. Consisting of three 18”x 30” stainless steel pans and two pieces of corrugated roofing metal, this salt cooker is cheap and easy to set up. We set the pieces of roofing metal on edge in the sand so they stood up straight, and then set the pans on top. 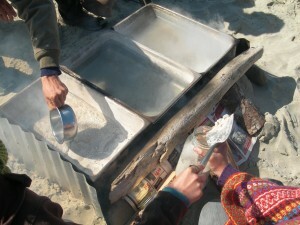 Sand was piled around the outside of the metal for insulation, and a fire was built under the pans. We had three pans in order to provide for different levels of concentration: to the first pan we added the fresh seawater, and then scooped the water as it boiled to the second pan, then to the third where the remaining water boiled off and the salt was scraped into a jar. All in all, we boiled 25 gallons of seawater (collected in 5 gallon buckets by brave souls who ventured out beyond the sandy wave break) and yielded ½ gallon of salt, a 50:1 ratio. I am told that this is similar to the ratio of maple syrup. This process took 6 hours of sitting in the sun on a beautiful beach. We also burned 1/16 of a cord of wood in the process. It took about 2 hours for the fire to get hot enough to start the water boiling and for the salt to be removed from solution. Saltwater boils at a higher temperature than salt-less water, so we had to be careful to not come in contact with it as we ladled and scraped from one pan to another. Many people agreed that the salt we made tasted “saltier” than other salt, and as we cooked with it, found that we had to use less than some recipes called for. The salt was very fine, and whitish grey in color. The ½ gallon of salt lasted our group of 25 for three of the four weeks of the program; a smaller group had to go and make a bit more to ensure an adequate supply for the last week. With this level of production, a small family could easily make their year’s worth of salt during a day trip to the beach. One of the drawbacks we found with this process was that the stainless steel started to warp and turn colors near the end of the boiling, perhaps due to the higher temperatures. This was a bit concerning, and the next time we went, we tried cast iron. However, with cast iron, the salt pulled the iron out of the pan and we were left with rust-colored salt that tasted, well, like salty rust. Our latest approach has been to commission a ceramics artist to make a mold of the size of the shallow trays, so that we can make our own hand-fired ceramic salt-cookers. I am still on the lookout for an area where salt accumulates naturally in shallow rock depressions along the coast, but have yet to find one that seems clean enough. The Oregon Coast lacks the wide, shallow flats of some coastal areas, such as the west coasts of India and France, where saltwater is collected and evaporates naturally in large shallow pools. We have also thought about bringing the seawater home to evaporate in our solar wood-drying kiln at Aprovecho. While the ‘One Hundred Mile Diet’ program is over, we are still, as an organization and as individuals, endeavoring to source as much of our food locally as possible. We know that it is possible to source 100% of our food locally, but the allure of chocolate, tea, mate, and coffee, has won over some of our tastes. We now buy olive oil from northern California, and have discontinued the purchase of the grains and beans from other continents. We have formed lasting relationships with local farmers and producers who are pushing the common conceptions of what is possible in a given area. The local foods movement is thriving in the Willamette Valley of Oregon. Perhaps it is not as immediately visible as Gandhi’s satyagraha movement to overcome British control of India, but here in this land, our efforts and our economics have been mobilized towards a durable and resilient local food system. This entry was posted in Uncategorized and tagged 100-mile diet, Food, Local Foods, Locavore, salt harvesting. Bookmark the permalink.